If you liked this show, you should follow Soul Evolution Center. 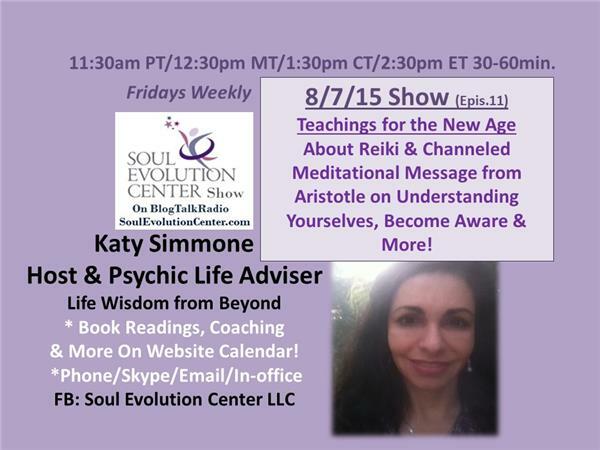 Learn about Reiki, the life force universal energy of self-healing, for others & pets.Hear Aristotle's inspirational messages #19 on Understanding Yourselves, Become Aware & More! Includes practical daily exercises to integrate into your life to flow through the changes of the New Age we are in. Use as a high vibrational meditation to uplift you. By Katy Simmone, host & advanced channeler of Light Beings. The Soul Evolution Center Show to Evolve into Your Best Life! A special time where different dimensions intersect for spirituality & metaphysics. Follow the show! For more of Katy's teachings, channeled messages, her psychic and out-of body experiences, see her Blog,Soul Evolution Center FB page, & YouTube.